Parking and launching: Any public access point on Drummond or at the resort you are staying . The Drummond Island shoreline is about 140 miles around from a starting point to return. The water trail around the island is series of water links to ‘interest points’ along a sixty mile loop. The interest points are settings where the experience of the area underlines Drummond Island’s unique characteristics. 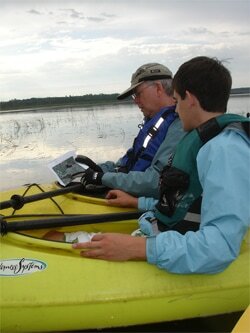 The links between the points of interest combine to make up the Drummond Island Heritage Water Trail. When considering the Drummond Island Heritage Water Trail you must review this website to identify the areas falling inside a circumnavigation route. The specialized paddling areas include, Cultural, Historical both Whitney Bay and Scammon Cove, Hatchery section on Scott and Maxton Bay, Environmental, and The DeTour Underwater Preserve. There are also two unique geological features identified as paddling destinations. One of these is the Fossil Ledges located on the north shore of Drummond Island. The other is called Marble Head, located on the eastern end of Drummond Island. Check out the map and read the DITA website reference to get the best detailed information for your paddling options, and your paddling adventure. 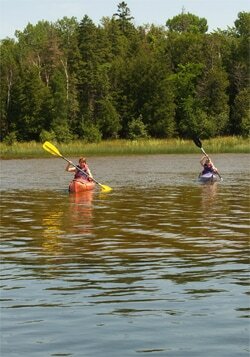 Drummond Island offers outstanding opportunity for long distance kayak touring. The allure of risk, challenge and adventure is powerful, and to respond requires good equipment, practice, confidence and partners. For safety reasons, solo touring is not recommended. Lodging can be found at resorts and campgrounds along north coast and Fort Drummond Marine and Resort offer cottages and camping on Whitney Bay. Remote tent camping is allowed, with a permit, on state land. Permits are available from the DNR website, Johnson's Sport Shop, or the Drummond Island Tourism Association Office located 8.1 miles east of the ferry dock, on the left hand side of the road at the blinking light. Long distance, open water touring can be risky. Paddlers need to be honest with themselves about his or her skills. Can I do a ‘wet exit’ and /or roll my kayak; do I know ‘re-entry maneuvers’ that allow me to right my kayak in a variety of weather and water conditions; do my paddling partners know basic rescue techniques and do I/we have the right gear for the trip ahead? Once the answers to this question start to trend toward ‘yes’ responses, the ‘absolute joy of paddling’ is within your grasp! As a paddler’s skills increase, one skill at a time, the range of trip opportunities expands exponentially. Drummond Island’s outfitters can take care of your needs and here is a ‘Before You Go’ check list of gear in case you forget something: maps and charts; compass, binoculars, first aid kit; paddle float and sponge; PFD w/ flares, whistle, knife and strobe; spray skirt; hatch covers; tow line; helmet and hat; sun glasses; cooking stove/fuel; food and water jug and filter; tarp and cord; headlamp and batteries; 2-way radio; dry bags for storage and waste disposal; spare camp clothes and quick dry Capilene. For touring, kayaks with more narrow and long hulls are more suitable for long distance paddling. Short, wide kayaks are slow but stable and easy to turn, while longer and narrower boats are faster and follow more of a straight line. When paddling ten to twenty miles a day, fast and straight is the way to travel. Circumnavigating Drummond Island can easily take 4 days for the average touring paddler. However, should your paddling preference be to hug the shoreline rather than cutting across bays you could dramatically extend the travel time to complete a circumnavigation of the Island. Paddling in a fog is something to be prepared for, as well. In a fog, a paddlers need to have a good idea where you are, where you are going, know what distance a normal paddling cadence will cover over a period of time. Truly, there is no greater wilderness experience than being fog bound and have places to go and schedules to meet. Fog can be humbling. Generally it is safest to hug the shoreline. If you feel confident in the surroundings, it might be possible to paddle between reference points. Keep out of and away from boat traffic. By all means, learn to trust your compass more than your ‘gut feeling’ to get your destination safely. ​Moonlight and night time paddling requires thoughtful consideration, as well. After dark, familiar place are transformed into places of mystery. Know how to find the North Star as a reference in addition to your compass. During an extended multi-day trip along the Drummond Island coastline, every thing changes. Add fog or moon light or weather related conditions, and the old Boy/Girl Scout admonition to ‘Be Prepared’ is nothing but the absolute truth. 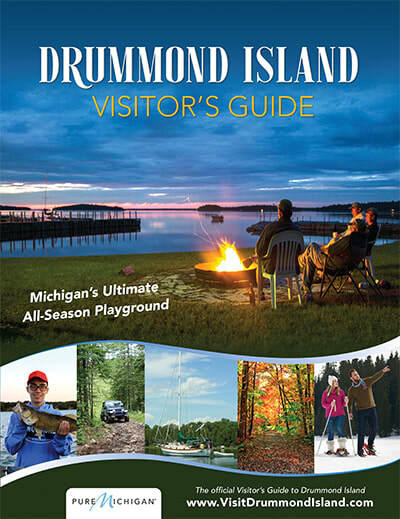 There are over fifty major islands in the Drummond Island Archipelago. There are also shoals that emerge as treeless islands only during low water cycles. Some are vegetated complex ecosystems offering habitat for wildlife, and cottage and home sites for human habitation. For kayakers the bay and islands are nothing less than good medicine for the soul. Slow down, glide to a stop, settle into your kayak and watch the sun come up (or set over) the North Channel. See the shadows the islands create, and note the clouds reflected on a still water. Be startled when a fish jumps or let your eyes follow the wake of a motor boat heading home after a long day on the lake, or an osprey soar on the wind. Look into the crystal waters and see stones or a log laying on the bottom, see how they form a painter’s pallet of color and know in your soul this is a moment that brings depth and quality to your time on earth. Lake Huron has many islands, most of which are located in Canadian waters. The chain of three large islands, called the Manitoulin Islands, includes Drummond Island (USA), Cockburn Island (Canada) and Manitoulin Island (Canada). The largest among the three is Manitoulin Island. Lake Huron is the second largest of the five Great Lakes of central North America. The lake receives the waters of Lake Superior, the largest Great Lake, as well as, the largest fresh water lake in the world, by surface area. The lake has a significant whitefish, lake trout and salmon populations and continues to support a significant sport fishery. The islands are historically known as a fishing region and popular for their resorts.